Looking for fun places to check out while others in your group visit Wintergreen Ski Resort? Cabin Creekwood’s cabin rentals in VA are located in a remote part of the Shenandoah Valley, right along Sherando Lake and adjacent to the Blue Ridge Parkway. We will send you a FREE packet of specialized secret insider tips for getting away to Central Virginia if you click here and provide your name and email address. If you wish to be send the FREE Insider Secrets on Things to Do in the area, click here. 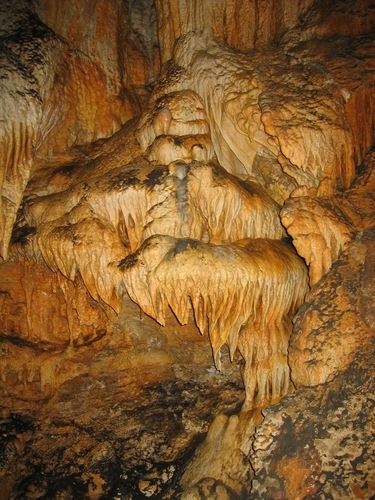 We are only about a 20-minute drive away from several attractions and points of interest in the Shenandoah Valley Virginia including the Grand Caverns. The Grand Caverns are a spectacular show cave, in fact it’s been ranked as the #2 caverns in the United States. It is our nation’s oldest show cave and a Natural National Landmark. It is located on the border of Rockingham and Augusta county. Be sure to bring along your camera, or phone to take pictures. There are numerous formations to take pictures of inside including ones with names such as: Persian Palace, Dante's Inferno, and the Bridal Chamber. Our location near Sherando Lake affords you plenty of peace and quiet and a chance to get outside and enjoy all of the nature that abounds. You’ll see wildlife and hear the sounds of the quiet, rumble of waters in the nearby river. Cabin Creekwood offers 9 fully appointed cabins in Virginia mountains. Some of our cabins are pet friendly and all are fully stocked with everything you need to enjoy a retreat. In the warmer months, guests can enjoy our in ground pool at the resort or go for a dip in nearby Sherando Lake. What you will not find at Cabin Creekwood are chain hotel amenities, and sub-par hospitality for your family. We are a family friendly small cabin rental retreat located moments from Wintergreen Ski Resort.